The Ellora Caves are an archeological site that represents the epitome of Indian rock-cut architecture. The 35 "caves" - actually structures excavated out of the vertical face of the Charanandri hills - comprised of Buddhist, Hindu and Jain cave temples and monasteries, were built between the 5th century and 10th century. The 12 Buddhist (caves 1-12), 17 Hindu (caves 13-29) and 5 Jain caves (caves 30-34), built in proximity, demonstrate the religious harmony prevalent during this period of Indian history. Maybe I was expecting too much: the raving reviews on this website, my memorable visits to Chinese rock-carvings in 2007, even the rare praise from ICOMOS in the evaluation report all had me geared up to a visit of one of the highlights of the WH List. The site did fail to capture me however. There were only a few caves that I found really worth seeing. They all are pretty dark inside and the floor is uneven so you have to be careful where to step. It would be good to bring a torch. My favourite cave was number 10: a Buddhist cave, the only chaitya among the monasteries. It was used as a music gallery and has fine acoustics. The exterior has a sculptured balcony, the ceiling carved ribs. A window was placed so to illuminate the big teaching Buddha in the center of the cave. Another one not to miss is of course the enormous Kailasha Temple. An unimaginable load of work that has been done to carve this all out of a monolithic rock. Its size and structure is difficult to capture on a photo. It resembles the Churches at Lalibela (though these carvings are even cruder). I visited on a Saturday morning, and especially the Kailasha Temple was overrun by Indian daytrippers. Young men ignore every warning sign, climb the sculptures and get overexcited on seeing a white blonde female. While travelling in India over the past weeks and attracting a lot of attention, I’ve resorted to only say ‘Hi’ or shake hands with anyone that looks under 10 years of age. The rest should just grow up and behave themselves. Guards that should protect the structures from vandalization are almost absent at this and the other Indian WHS that I have visited. And that in a country where every public service is seriously overstaffed, where crowds of 10 waiters/helpers/managers/big bosses fight over each other in a small restaurant to bring you one spoon or fill up your glass. I visited this WHS in November 2016. I had already marked it as a top WHS and it surely didn't disappoint. Even though there is another great WHS relatively nearby (Ajanta Caves), I think both deserve a lengthy visit (if not a revisit) for different reasons. Ellora Caves is made up of 34 caves from 3 different religions and the majority of the caves have beautiful carvings and/or sculptures apart from the architectural genius involved. 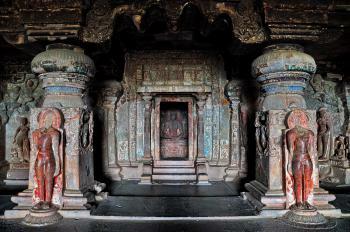 The closest cave to the entrance, Cave 16 or Kailasanatha temple, would easily deserve inscription alone for its unique architecture and complexity (picture). Any point of view but especially from above will help you appreciate this mindboggling piece of architecture. My personal favourite were the Buddhist caves, especially the 2 and 3 storey ones for their rock-cut Buddhas and Cave 10 (quite similar to Ajanta's Cave 26) for its acoustic properties. 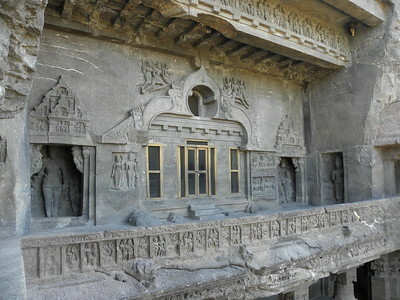 The Jain caves are also worth visiting but to me were the least interesting having visited other Jain temples in India. I spent a whole day at Ellora and I kept revisiting Cave 16 for different lighting, angles and perspectives and Cave 10 whenever a Buddhist monk visited to experience the soothing chants echoing throughout the cave. On the way to the caves from Aurangabad, I also stopped to visit the Daulatabad Fort and Minaret. I would strongly recommend visiting Ellora and Ajanta on different days if possible so as to take them in at leisure. After a very satisfied tour at Ajanta Caves, I continued my journey to Ellora Caves, another rock craving wonder of India near the city of Aurangabad, to see the famous Kailasa Temple. When I arrived Ellora I was very surprised to find out that there was no tourist facilities or protection scheme like in Ajanta. From the entrance next to the main road I immediately saw the large Kailasa Temple with hundreds of tourists and a nice flower garden, a common landscape decoration in other countries’ tourist attractions, but a rare sight in India! Since the place was quite large, tourists could drive their cars to see Hindu and Jain Caves directly. Jain caves were the first group of caves I saw, this was my first time to see Jainism temple. I was amazed with its unbelievable intricate details of rock craving and the fact that many ancient colors were still visible. The design of caves layout and details were truly unique and depiction of Jainism icons really like ancient Egyptian one. The next group I saw was the Hindu caves, I had to say that I did not feel any special with this group of caves, apart from the impressive rows of columns in cave 29 and ridiculous dry waterfall landscape. The depiction of Hinduism deity was not graceful like in Elephanta Caves near Mumbai, but the depiction of Giant also in cave 29 was truly impressive, the face really reminded me the face of Ni-o Guardian in Japan. Then I went to see the Kailasa Temple, at first I was overwhelmed by its size, dark color, and hundreds of colorful sari of Indian women in the compound. After looked around the temple for about 45 minutes, while the temple itself was a wonder of ancient engineering, the impressive cut to make corridor around the main temple was breathtaking, a great evidence of human genius and creativity using for god, I hardly could say that I enjoyed Kailasa Temple. I found that the overall craving depictions were not such great compared to Jain group or in Ajanta or Elephanta, the brilliant depiction of Ramayana story was great but few scene that truly stunning. The temple architecture was similar to normal Hindu temple, so only the fact that this temple was monolith was impressive for me. I also did climb to see the whole Kailasa Temple from the cliff behind the temple; the view was stunning and gave me a chance to see details of temple’s spire, but in my opinion the best reason to climb up here was to see cave 15, this small but intricate cave by far the best cave in all Hindu group. Then I went to Buddhist group, since I saw the better one at Ajanta, I did not feel any special and decided to walk back to Kailasa Temple where my driver, who eagerly wanted me to visit Himroo sari factory, was waiting. Although the overall experience of Ellora was great and Ellora itself was truly impressive, I would prefer Ajanta more than Ellora. Since Ajanta was much better in terms of location and site protection management than Ellora. Since I already saw all currently UNESCO World Heritage listed man made and natural cave temples in South Asia, Ajanta, Ellora, Elephanta and Dambulla in Sri Lanka, I would like to point out the best of each four sites for other people to understand their uniqueness. If you want to see the best Buddhist craving and paintings then go to Ajanta, to see the most graceful Hindu cravings then Elephanta, to see the engineering wonder then Ellora, to see the most vivid Buddhist iconography then Dambulla, but better to see all caves and enjoy the trip to incredible India and Sri Lanka. Exploring the Teen-tala cave was an uplifting experience. The way it has been designed that the worshipper becomes a part of the spiritual mandala in the third storey is indescribable. The Kailasa temple is a lesson in planning and execution. The grandeur of the temple the way it must have existed can only be imagined. I was charmed by the Gajalakshmi panel, the welcome panel, the platform of lotus leaves and the goddess above that seated in a lotus and the bathing elephants are just superb, creates a landscape of pond with blooming lotuses and cllo green leaves! The Kailash Temple was perhaps the finest single site I saw on my whole 3 week trip in South Asia. It marks out the Ellora caves as a truly world class destination, and one that should not be missed if you are in central India. There are three religions represented across the 32 of the complex. The Buddhist caves are the earliest, and have many similarities to those at Ajanta, but do not have the painted interiors of that site. The Jain caves have some particularly impressive carvings, they are not as large as the others but they are finely detailed. The bulk of the highlights though come in the Hindu caves, which at times can be massive. The Kailash temple was absolutely astounding, and could easily be a world class WHS on its own, even without the 30 other caves. The impressive style of the carvings, the monumental size and the great views afforded by the surround galleries and hill made this extra special. It was really worthwhile clambering up the hill surrounding it to get a birds-eye view of the whole ensemble. I managed to visit the caves in the same day as Ajanta and I felt that I did each site justice, visiting every cave and having repeat viewings of the major highlights. Astounding, don't miss if you are in central India. I escorted a Japanese group from Kathmandu to Mumbai in 2000. We went to Elephanta Caves which was marvelous, went to Ajanta which was truly unique and then to Ellora and later to Udaypur, Jaipur and Agra and spent hours at the Taj Mahal appreciating and absorbing the beauty. I have lived in Rome for 4 years and have been several times to the Vatican, the Colosseum, fountains of Tivoli, Venicia, Pompei, etc. Have traveled the length and breadth of India, ME, USA, Japan, SEAsia and so many places. Lived another 5 years in Japan and did the same. Nothing, nothing in this world has fascinated me more than Ellora!! It is a place of worship, pilgrimage, meditation, study and relaxation!! It is a place to discover your inner self by comparing your own life with the lives of those who designed it, built it and were never heard of again for over a millennium ago!! It was truly mind-boggling man's gift to the world - Voila Ellora !!!!! If you are a human being in every sense(especially from India) and have never been to Ellora - then you are missing one of mankind's greatest achievement!!!! I have been to Elura twice- and any time I am in India, I will never fail to make it a central stop of my trip. The Kailasha Temple is a wonder, carved from the living cliff. Photographs cannot capture it. Don't miss the small chapels carved into teh sidewalls of the dig-out, especially the shrine of the Saptamatrikas! The Kaila also includes one of the most beautiful scultpreus of Sri-Lakshmi I have ever seen. The Buddhist caves are fascinating for early Buddhist iconography and understanding. Some of the acoustics are wonderful as well. But be sure not to miss the Jain caves. Some of the finest of the sculpture and paintings are there, and there are a lot fewer people, so you can really enjoy them. Local facilities are good- I enjoy the nearby hotel and its restaurant. Also, the local textiles are fabulous! I have visited Ellora many times when I was staying at Aurangabad. The caves are simply wounderful!Even if you visit the caves many times, you will not be satisfied. will still feel to visit the cave once more! More you visit the caves, more you fall in their love. During every visit you find a new angle, a new vision! So, make up your mind & start preparations to visit the caves at least once in a life! 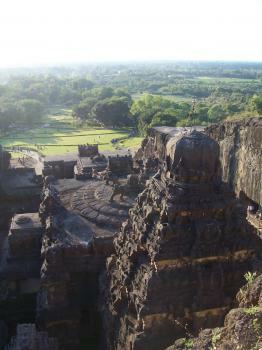 In my opinion Ellora is one of the great sites and sights of the world. It easily enters my category of “Worth a journey”. Don’t even think of not going there if you are in Central India! The site is situated about 30kms outside the city of Aurangabad. The road to it passes the fortress of Daulatabad which is worth visiting even if you are not on the Tourist Corporation tour (We went twice to Ellora :- once on the “tour” and then the next day by ourselves to soak it up at our own pace). At Ellora there are 3 sets of caves totalling around 30 in all – Buddhist, Hindu and Jain each with its distinctive style and iconography. But the highlight of them all is the Kailash Temple. The entire structure is cut from the living rock into a cliff face. The result is an enormous (30 metres high?) free-standing stylised representation of the holy Kailash Mountain in Tibet surrounded by caves cut deep into the side walls. As you walk round the base of the “mountain” you are in a narrow defile between it and the cliffs from which it has been hewn. Indeed you often walk under the cliffs themselves with thousands of tonnes of rock over your head (photo). All round the sides and on the face and inside the “mountain” itself are room/halls/caves and amazing sculptures of Hindu gods and symbols. And don’t forget to take in the view from above by climbing the cliff – oh, and then there are all the other caves to see! I am a Buddhist and I have been to Ajanta Ellora twice (1992 and 2006).I am very much proud that my forefathers were one of the first to give this wonderful carving to the world.I named my building company as ELLORA PROPERTY IMPROVEMENTS.I am living in London from the last 41 years but i always go to see my Heritage.There is still an abundance of Bhuddist heritage all over India, even though Hindus have destroyed most of it.Now Buddhist scholars are digging their history and revealing lots of truth.Thanks to British people like Lord Cunnunigham who started searching Why and how Buddhism was destroyed from India.If there was some thing wrong in Buddhism how come it is ruling in 26 countries in majority.Muslim may destroyed 20% but Hindus destroyed 80%.Ajanta was dicovered after 800 years by Englishman tiger Hunter.It was covered by Hindu Adi Shankeracarya. The Ellora caves reflects the three faiths of Hinduism, Buddhism and Jainism between 350 AD and to 700 AD. There are 34 temples but only 12 of them are belongs to the Buddhist period, a certain representation of the slow decline of Buddhism at the time. The Chalukya-Rashtrakuta rulers were the main patrons of the cave temples of Ellora and many kings and merchants donated huge sums of money for the construction of the cave temples. A temple was supposed to give salvation and religious excellence to the kings. As a first-time visitor, you are immediately impressed by the fact that all temples, pillars, balconies and sculptures have all been carved out of ONE piece of rock. It’s a dwindling thought when you realize that there is only one chance to get it all done correctly. 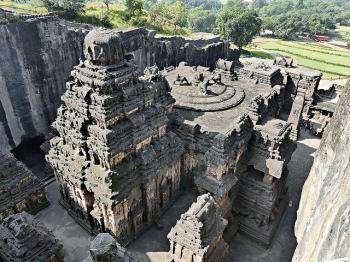 The masterpiece at Ellora is the Kailasa Temple. Dedicated to Shiva, it is the world’s largest monolithic sculpture, hewn from rock by over 7000 laborers over a 150-year period. Over 200.000 tons of rock has been removed to create the temple which covers an area twice the area of the Parthenon in Athens and is also 1½ times as high. A visit to the Ellora Caves is a breathtaking experience. This is truly a World Heritage Site in the same class as the Pyramids, Petra or Taj Mahal and an absolute must place to stop at when you plan you Indian travel route. I have been in Ellora caves late July 2004. It is one of the best world heritage places. Very impressive Kailasha temple, but also very interesting the first budist caves with the waterfall in front of the entrance to the caves. The engineering and work that must have been involved in creating this wonderful place is truly mind-blowing. Purpose Built Visitor Centre: Buffer zone, inaugurated 2013.